Barcarolle from The Tales of Hoffman (Jacques Offenbach). Performed by Lucy Isabelle Marsh & Marguerite Dunlap. Victor 60096. Recorded in 1912. Lucy Isabelle Marsh Society on Facebook. What can be done when a one of a kind recording on cylinder or disc is in such a fragile state that the touch of a stylus could destroy the audio you are trying to preserve for posterity? What if the record can be played but is so worn out that the sounds are barely audible? What if you could take a photograph of the recording and play it back while omitting all the damage in the groove walls? IRENE can do just that. Developed at the Lawrence Berkeley National Laboratory, IRENE offers hope to archives around the world for recovering sounds from fragile and deteriorating media. How Edison Got his Groove Back ? KQED. I released VOCP 10 years ago and each year as we get closer to the Christmas holidays I get overwhelmed with requests for it. The disc is out of print and I have no copies left so I’ve uploaded the files for all to enjoy. Just scroll past the liner notes to get to the music player. From the original liner notes: Of all things Christmas nothing is more traditional than the singing of carols and songs. Songs that capture in lyrics and in music the many traditions that we have at Christmas – the birth of the Christ child, the Christmas tree, the opening of gifts and even sleigh rides. Any well dressed sleigh ride featured those cheery sounding bells attached to the horse’s harness. In fact one of the most beloved Christmas songs ever, “Jingle Bells” celebrates this sound and the spirit of a country sleigh ride. On October 30, 1889 banjoist Will Lyle made history by recording “Jingle Bells”, the very first Christmas record. Although no known copies of this record survive one of the earliest vocal examples of “Jingle Bells” does survive on an Edison brown wax cylinder entitled, “Sleigh Ride Party”. It was made a decade later and was reissued for the first time on this CD (now out of print). 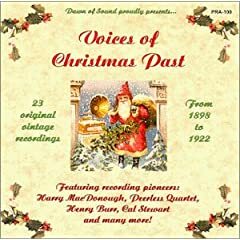 This collection of carols, songs and monologues from the original vintage recordings capture the essence of the Christmas spirit as it was in the opening two decades of the 20th Century. So gather up the family, wind up the phonograph and take a trip back in time to the early 1900’s and celebrate the holidays with the “Voices of Christmas Past”. 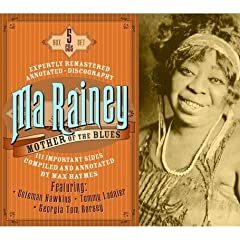 Ma Rainey – Mother of the Blues is definitely a title that no fan of vintage blues should be without. The ledgendary Rainey recorded over 100 songs between 1923 to 1928 for Paramount, a company notorious for using very poor recording techniques.? In addition to the low quality materials used in the pressings, playback devices of the era wore out the discs quickly. Today it’s almost impossible to find a Rainey record that is in playable condition, and no metal masters survive. This release by JSP records pulls together Rainey’s entire cataloge (including alternates) from the best surviving pressings they could find. The restorations are quite good considering the source material and although some hiss and surface noise remains, I can appreciate the hard work that went into making these records listenable. Hello vintage audio lovers….special greetings. Here are some reviews of new and not so new releases of vintage music on compact disc and DVD. There’s a new kid on block! ‘CEDAR’, a stunning British-designed computer software that has made listening to vintage audio on CD a new and startling experience, has introduced changes. This ‘new kid’ is called, ‘CEDAR Cambridge’. It’s been to used to special effect on a new compact disc reissue of Arthur Nikisch’s truly astonishing recording of Beethoven’s Symphony No. 5 recorded in 1913. Not just the Beethoven but Nikisch’s other acoustic discs as well…..shorter works by Beethoven, music by Weber, Mozart and Liszt. I initially heard the Beethoven symphony on a 1982 LP release. Next followed the first issue on CD. This was on Symposium Records in 1991. EMI offered the recording again in 2002 and in slightly better sound. Now in 2008 this ‘new kid’ has been tried out. There are marginal improvements and it’s these marginal improvements that make this CD worth the price of owning. What comes through is magical and with a special majesty. Nikisch’s performance has structure and architecture. He shapes and urges the work on beautifully. There is a curious drawback. You can actually hear the software at work…like a gate opening and then closing. The result are curious digital artifacts and these may be a necessary evil. Obviously the ‘new kid’ has to handled with great caution but this CD is worth the effort of further exploration. This is another landmark release by a record company that definitely knows what it’s doing. This present CD is no exception. Archeophone let’s the recordings speak for themselves. They’re restorations never attract attention to themselves. This is important. Herein is a superb reissue of some this vocalist’s recordings from as early as 1903 and stretching into the late 1920’s. Burr is a Canadian. But Henry Burr is a pseudonym. His real name is Harry McClaskey. Oddly you’ll see recordings that feature Henry Burr or Harry McClaskey…on other record labels he uses curious inventions of this combination of names. The first thing that attracts anyone to any Archeophone CD is the research that produces superb programme notes. These are exceptional. McClaskey sang in quartets, in trios, in duos but most notably he was a tenor whose voice recorded beautifully all by itself. The reward for McClaskey was stunning sales figures for his recordings. Figures that made him a true recording star by the time his career came to a close in 1928. I swear you can even hear some of the tears falling from his cheeks when he records those songs that made listeners hearts pause. Listen to track 26. It’s his 1927 recording of, “Are You Lonesome Tonight”. Was it this recording that Gladys Presley had in mind when she asked her son, superstar, Elvis Presley to record more than 30 years later? Here’s an impressive fact; his earliest recordings were in 1903…..his final recordings were made in 1928….over that 25 year span he cut more than 5000 discs. WOW!!!!! American-born vocalist, Billy Murray was another HUGE recording star in the pre-radio, pre-electrical recording era. One does not compare Billy Murry to Henry Burr…there was simply no point…they were both fabulous performers in their own right. Fabulous even in spite of the fact that they recorded virtually the same repertoire. They brought their own flair to bear on the songs they made. This Archeophone CD celebrates Murray’s amazing legacy. But just one CD won’t do it. This just scratches…pardon the pun…the surface in a manner of speaking. 30 tracks contained herein. Recordings from 1903 to 1940….commercial material and some private recordings are included. Again, so typical of the ‘Archeophone’ philosophy, the restorations of these tracks don’t intrude. You get period sound with all of the benefit but without excess noise. In 1958 an obscure, at least to me, American record company called, “Everest Records” issued a LP in versions for monophonic record players and the then newly introduced stereophonic players that featured recorded music by one of the legends of audio, Raymond Scott. In 2007 this LP has been issued with both mono and stereo versions of the music that tried to mix a rock and roll sensibility with late 40’s and 50’s pop tunes. Raymond Scott was very much a man of the future. Go to: www.raymondscott.com for more information about Scott. This CD features his arrangements of popular tunes of the late 1930’s and 1940’s. This was a curious experiment and a great deal of success came from Scott’s musical innovations featured on this LP. I get the impression that the record was not a great hit but that the innovations that Scott introduced where heralded in other ways. This CD is clearly an audio curiosity. For anyone interested in early stereo on LP records this issue is right up your alley. Rock and roll for the entire family? Well….not quite!! The stereo versions of these tunes sounded better than the mono version. A Canadian jazz musician has died. Jeff Healey would have loved being called a ‘jazz musician’. Jazz was, after all, at the very heart of his very soul and being. In addition to his astonishing accomplishments as a musician and vocalist, Jeff Healey was also a devoted record collector. Last count he had more than 30,000 jazz recordings covering dates from the teens to the late 40’s and 50’s. He also nursed a quiet, unspoken passion for dance bands of the same period. Jeff’s last CD, ‘Mess Of Blues’, released in April of 2008, in so many ways embodies so many of things he learned from listening to old recordings. Original to the end and who of us would not to love crawl inside of Jeff’s mind and know the ideas he was using that he’d heard on shellac. He was the consummate collector and Jeff knew his stuff. In fact his talents as the collector surfaced in 1996 when he compiled Disc 1 of a 4 disc set devoted to jazz recorded by Victor. The set was called, “Body and Soul: 80 Years of RCA Victor Jazz”. Jeff focused on his special interest…early jazz. Five of the 22 tracks carry the moniker ‘never before released on CD’. He also researched and wrote the ‘album’ notes that accompany Volume 1. Surf the ‘net’ to find this set. Jeff’s contribution to the set is worth owning. Jeff Healey….gone but far from forgotten. The Victor Talking Machine company, before it was swallowed up by RCA in 1929, was exploring new territory when it released a series of discs featuring ‘Southern’ music. There were ethic-based, folk tunes largely passed down orally from generation-to-generation. This new territory included a new recording technology licensed from “Western Electric”…..in some circles it had the towney description of “Orthophonic” (sounds like a treatment for sore muscles!!!!! )……and music new to the Victor catalogue. It was 1927. It was all amazingly simple; a recording crew set up shop in a converted shoe factory. What resulted was 76 recordings by 19 performers. New stars were born. This first CD captures these early instrumentalists and vocalist. Firsts for the Carter Family, first for Jimmie Rogers and other musicians eager to explore what life was like on records. Many were not disappointed. What compelled me to own this CD was the bare-faced honesty of everyone involved. There is no arrogance but raw, unabashed talent. I’m waiting for Volume 2 of the Sessions to be released. What turned my crank? Track 12. A tune called, “Narrow Gauge Blues”. Harmonica playing like I’ve never heard before. You could smell the steam, hear the locomotive’s whistle and feel the lurch of the coaches. I want more!!!!! This 2-DVD set features documentaries dealing with aspects of vintage motion pictures. “Movies Dream in Colour” and for my purposes here at ‘Dawn of Sound’, “Learning to Talk”. Both are chock full of carefully and beautifully restored vintage film clips and vintage sound clips that feature early explorations in the development of colour for film and audio for film. Where sound recording was concerned I was absolutely captured by the efforts to make synchronized sound feasible. If you like the recent “Jazz Singer” that Peter Nagy reviewed this set is a ‘must see’. All of the early sound pioneers are featured including the work done to perfect an early amplifier using pressurized air called the ‘Auxetophone’. I was intrigued to learn that early sound-on-film technology was pioneered as early as 1916. This set is a ‘must own’ for anyone wanting to ‘hear’ and ‘see’ what early cinema pioneers were involved with AND where these early investigations eventually took us. Special thanks for giving these reviews considering. I’ll be back in the fall. The invention of sound recording has always been credited to Edison but inventer Edouard-Leon Scott de Martinville beat Edison to it by a few decades; well sort of. Scott de Martinville found a way to record sound onto a lampblack-coated cylinder with his invention the Phonautograph. The intent was to capture a visual representation of sound for study but never to play it back. Reserchers David Giovannoni, Patrick Feaster, Richard Martin and Meagan Hennessey have located some of the phonautograms and with the aid of modern technology have sucessfuly recoverd some of the earliest examples of recorded sound. For more information visit First Sounds. Warner Home Video is leading the way in film restoration and preservation. Their latest effort brings you the special edition box set of Al Jolson’s The Jazz Singer (1927) in stunning visual and audio quality. Although often regarded as the first talking picture, which it is not, it is the first sound film to make such an impact with film audiences that it ushered in the sound era literally overnight! The Jazz singer is really a silent film with a synchronized music score and synchronized sound sequences featuring Jolson performing some of his signature songs. As the film transitions from silence to sound you see and hear why they called Jolson the “World’s Greatest Entertainer”. He is simply hypnotizing and he certainly knows how to handle the new sound technology that ended so many silent actors’ careers. The story comes off as dull and sappy but it’s worth watching for Jolson’s performances and also for its importance in film history. Also on this disc are some Jolson short subjects including the recently recovered “Plantation Act”, Jolson’s first sound film. The digital restoration work is first rate with picture elements looking as if they were shot yesterday. The remastered soundtrack restored from the best surviving Vitaphone discs sounds excellent and is free of any distracting noise. Disc 2 contains the documentary “The Dawn of Sound: How movies learned to talk”. It’s a fascinating glimpse into the coming of sound films and the technical obstacles that stood in the way. Also included on this disc and not to be missed are two surviving excerpts from the second ever all-talking film shot in Technicolor, “Gold Diggers of Broadway” from 1929. For some reason the first clip “Tip Toe through the Tulips” is missing from my copy and in its place appears a ballet sequence beautifully shot in two-colour Technicolor, probably from the missing 1930 film “Rouge Song”. I still would like to see Tulips and hope that Warner makes available a disc with the missing number. What excites me most about this set is the treasure trove of restored Vitaphone shorts on disc three. Here you’ll see (and hear) familiar names like Burns & Allen but you’ll also see forgotten vaudevillians in what may be the only surviving examples of their work! These shorts seen here for the first time since their original release have also received extensive restoration work and they look and sound great. If you like early sound films this is a must have for your DVD collection! Santa Claus hides in the phonograph, Cal Stewart falls down the chimney! The Peerless Quartet on an old fashioned sleigh ride, classic Christmas carols and the first ever recording of Jingle Bells! I hope you enjoy this trip back in time to a 1900’s Christmas. ©1998 - 2016 Peter Nagy, Dawn of Sound.